What's interesting on this page? 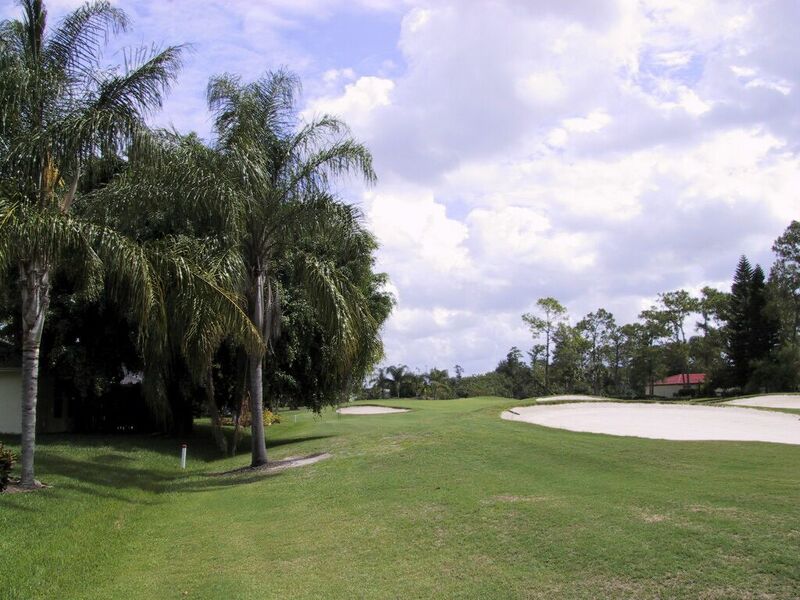 All Golf Courses of Naples! The most important thing in GOLF! Ever hear the old adage - "Practice Makes Perfect"? Well, it should be "Practice Makes Permanent". Without a sound practice routine, we are only making our bad habits PERMANENT! Only perfect practice will make our swings perfect. Here are some hints that will help you achieve your goals. Always have a specific goal or item to work on (e.g. grip or stance etc.). 1.) Focus in on this one item. 2.) Work on this one item for short periods so as not to lose your concentration. 3.) Start with a wedge first, then proceed through the rest of the bag. 4.) NEVER HIT A SHOT WITHOUT A SPECIFIC TARGET IN MIND! 5.) Always use your pre-shot routine. 6.) Keep notes on your progress with changes. 7.) Putting and short shots (inside 100 yards) account for two thirds of your score!!! DIVIDE your practice time accordingly. HAVE A SOUND PRACTICE ROUTINE! Chipping is a vital part of the game we call golf. A good chip can over a less than perfect approach shot. A poor chip can compound the previous mistake. 2.) Ball placed off right foot with short irons and centered with miid irons. 3.) Place hands well forward of the ball. 4.) Head steady, crisp firm stroke, brushing the grass on the follow through. 5.) Arms, hands and shoulders work together as one piece (pendulum). 6.) Get the ball on the green and rolling as soon as possible. 7.) Use the appropriate club for the shot at hand (fly/roll): 9 iron 50/50, SW 70/30, 6 iron 20/80. USE THESE FUNDAMENTALS TO LOWER YOUR SCORE! Putting is the part of the game that we very rarely think much about, but we sure know when were not putting very well! Three or four putting will ruin a score faster than a short or wayward drive. Yet we rarely ever practice putting except for a few quick ones just prior to teeing off. To improve our putting we must practice, but we also have to practice correctly. Here are some things to remember while practicing. 1.) Make sure your eyes are directly over the ball. 2.) Hands, arms and shoulders must move together in one piece with a pendulum motion. 3.) The body must remain still, especially the head. 4.) Stroke the ball. Do not hit at it. 5.) Focus on the speed of the putt, stroke it firmly enough so that it will finish about 1 foot (30 cm) past the hole, as if the hole was not there. 6.) Distance control is more important than the amount of break in the putt, therefore practice from preset distances (i.e. 3 feet, 6 feet, etc.) by stepping off each putt. 7.) Vary the distance of the putt by lengthening your stroke not by hitting it harder. PRACTICE CORRECTLY AND YOU WILL BE THE ENVY OF YOUR FOURSOME! Sand shots, we all dislike them, but unfortunately we all have to use them. Most golfers have the wrong concept in performing this shot. This is a finesse shot. Technique and setup are more important then strength or power. There are three basic types of sand shots around the greens. They are the high soft blast, mid soft runner and the low hard runner. The type of lie you have will dictate which options you have. 1.) The ball must be played off the left instep. 2.) Open club face under ball to a high full finish. 1.) The ball must be played in the middle of the stance. 2.) Club face square, aim towards pin, finish high and allow for some roll upon landing. 1.) The ball must be played back of center. 2.) Club face square or slightly closed, bury the club head behind the ball with virtually no follow through and allow for considerable roll. USE THESE TECHNIQUES AND YOUR BUNKER PLAY WILL IMPROVE!!! There are virtually thousands of trouble shots in golf. However they generally fall into some set general categories. The uphill or downhill lie, the side-hill above or below your feet, the bare or tight lie, and the buried in the rough up to your ankle shot. Setting up properly will greatly increase your success in these shots. The correct technique and a good imagination are critical to the final out come. 1.) Set body angle to match slope as well as possible without upsetting your balance. 2.) Position ball left of center and use 1 to 2 clubs more as ball will tend to fly higher and shorter than normal. 3.) Swing smoothly to ensure stable balance. 1.) Set the body angle to match slope as well as possible without upsetting your balance. 2.) Position ball right of center and use 1 or 2 clubs less as ball will tend to fly lower than normal. 3.) Swing smoothly to assure stable balance. 2.) Grip down on club to coincide with ball being closer to hands. 3.) Aim right of target with an open stance, ball will tend to hook. Caution, if you become aggressive you will pull hook this shot! 1.) Take normal stance then increase knee bend to reach ball. 2.) Taking 1 or 2 more clubs may help in reaching ball on severe slopes. 3.) Caution, ball will fade from this type lie. Use a slightly closed stance. If you aim more than a little left of target you will slice more than you anticipate. 2.) Position ball slightly back of center. 3.) Strike ball crisply but smoothly. 4.) Caution, if your sand wedge has a lot of bounce in the sole it is very easy to this (scull) this shot. Use your pitching wedge instead. 2.) Open club face ever so slightly to compensate for the tall grass closing the club face at impact. 3.) Position ball back of center to decrease the amount of grass between ball and club face. 4.) Caution, long irons (1-4) are not suited for this type of shot. Use your 4, 5, 7, or 9 wood for longer shots from the tall grass. The larger heads and bigger sole plates allow them to slide through heavy thick grass. 5.) Trouble shots are interesting, challenging and rewarding when executed properly. Focus on these fundamentals and the trouble shots will not be so much trouble after all. EXECUTE TROUBLE SHOTS WITH CONFIDENCE!!! If you want an excellent information about Naples' golf courses, about Green Fees, about the TOP TEN RANKING? Give them a try and click: All Golf Courses! But be patient - loading text of more then 60 courses needs some seconds. Without CONCENTRATION, no game can be played well. This is true of chess, bridge and backgammon, and equally true of tennis or golf. One must have his mind on what he is about. In golf, it means invariably paying attention to the ball on each shot and from start to finish. This is the reason for such directions as to "keep your eye on the ball", "head down" and "hit through the ball". RELAXATION is as important as concentration. Tensity is a fault. Of all games, golf especially requires these two opposites in the making of every shot - complete concentration and complete relaxation. The eye does not concentrate more than a few seconds. Make your shots, therefore, without undue delay. This makes attention easier, and aids relaxation. Attention is aloofness to everything.